Do not miss more posts make sure you join this group today! 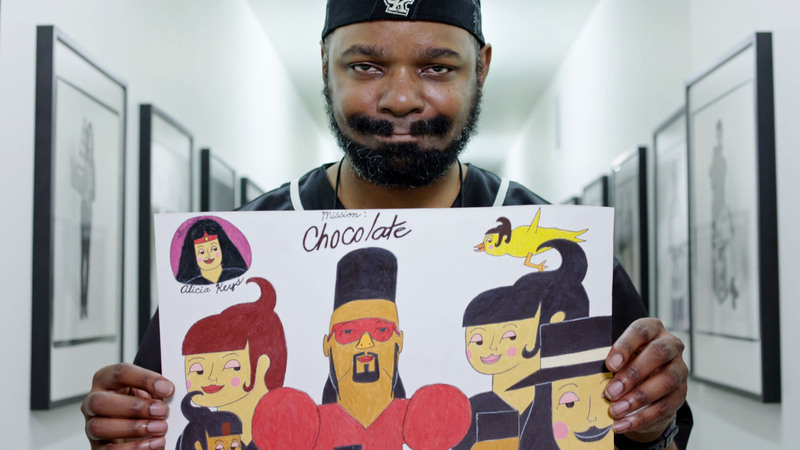 Gerone Spruill, artist at Creative Growth Art Center in Oakland, California. Image from Season 9 of Art in the Twenty-First Century. At various times during the school year, my students often ask the same question: How can the choices that artists make affect others? They want to know how artists—beyond providing aesthetic pleasure or provoking viewers—can make a difference. Through working with others and designing works of art intended to help people, three artists from Season 9 illustrate how one can make important choices that have broader implications, both locally and globally. 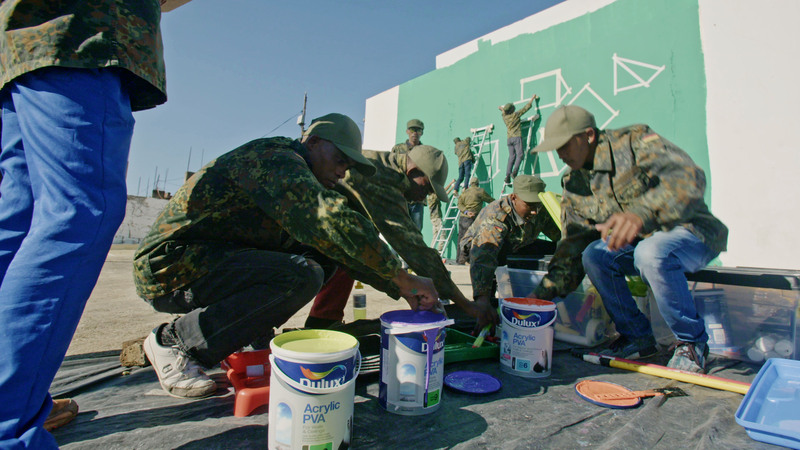 Robin Rhode and his ‘army’ in Johannesburg, South Africa. Image from Season 9 of Art in the Art in the Twenty-First Century. Robin Rhode employs an “army” of assistants in Johannesburg, his childhood home, to create a body of work: their activities range from constructing installations that will be photographed to modeling and performing in the works as stand-ins for the artist. 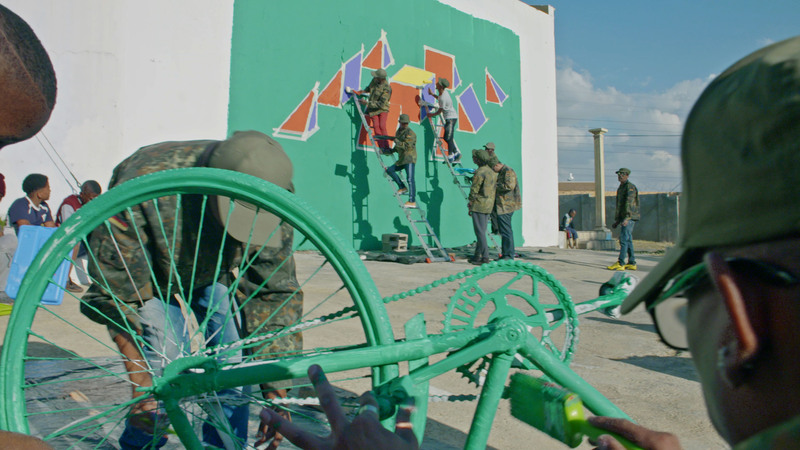 In Rhode’s segment, from Season 9, the artist worries about how his team of collaborators gets along while he is in his Berlin studio, planning for other projects, and is not with them on the street in Johannesburg. He laments that there isn’t much for kids growing up there to do since local ball fields and parks have become hostile places for children and families. Especially in today’s social and political climate, teaching students about the positive effect of Rhode’s simple gesture—working with young people on something that starts with a small idea—is a lesson worth sharing. Rhode decided to extend his approach to art making, specifically to include others in his studio practice. While his work naturally grew larger in scale as others joined the process, it also became more nuanced and complex. One wonders: What might his collaborators gain from this ongoing experience with him, beyond receiving cash in exchange for their work? 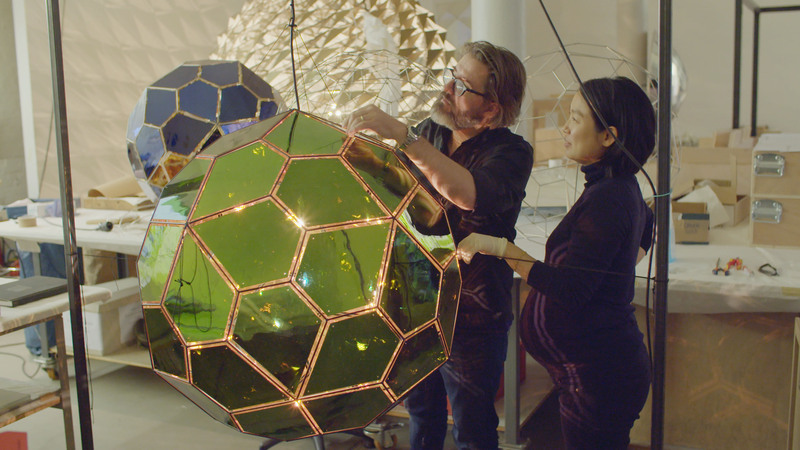 Olafur Eliasson in his studio in Berlin, Germany. Image from Season 9 of Art in the Art in the Twenty-First Century. Olafur Eliasson and Frederik Ottesen co-founded the Little Sun corporation, which produces small, solar-powered LED lamps designed to provide a renewable light source to people without access to electricity. Eliasson harnessed his desire to make broad social, political, and environmental connections through his work and joined forces with Ottesen to design a product that can make people’s lives better. Season 9’s Creative Growth segment asks students to question the stereotypes often associated with disabled people. In his segment, in Season 9, Eliasson asks how can art serve as a “civic muscle” and “create solutions, just like science has created solutions” for people. Teaching students about how Eliasson’s work as an artist dovetails into his work as a designer, inventor, and environmental activist helps them to see possibilities beyond Eliasson’s site-specific installations. What if more artists decide to utilize their creativity in ways that might help other people? Dan Miller, artist at Creative Growth Art Center in Oakland, California. Image taken from Season 9 of Art in the Twenty-First Century. The Creative Growth Art Center, a non-profit organization in Oakland, California, provides studios, gallery space, and materials to artists with disabilities. 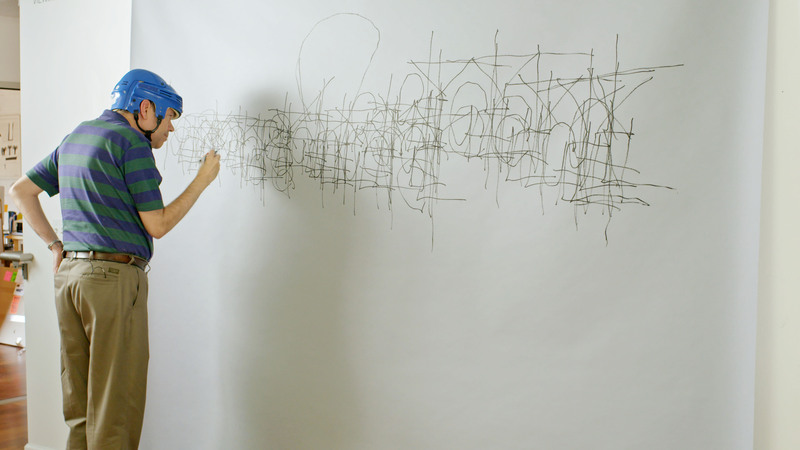 Led by the filmmaker and former curator Tom di Maria, Creative Growth gives artists with developmental, mental, and physical disabilities a place in the world of contemporary art, one that is not marginalized as “outsider” art or art made by those with special needs. Teaching students while utilizing Season 9’s Creative Growth segment asks them to question the stereotypes often associated with disabled people. Challenging students to identify specific stereotypes that are proven untrue during this segment can bring forth a powerful learning experience. Students and teachers alike may also want to consider how di Maria, through de-emphasizing the disabilities associated with the artists at Creative Growth, creates new opportunities for them. Robin Rhode, Olafur Eliasson, and the leaders of the Creative Growth Art Center all make conscious, important choices to help other people as they form ideas for their artworks. While other artists featured by Art21 also collaborate meaningfully (El Anatsui, Cai Guo-Qiang, Joan Jonas, Theaster Gates, and Carrie Mae Weems come to mind), these Season 9 artists, who include other people in the artistic process or provide opportunities for those without access, are role models for students who seek examples of collaboration at its best. Robin Rhode, Cedric Johnson from Creative Growth Art Center and Olafur Elliason. All images taken from Season 9 of Art in the Twenty-First Century.